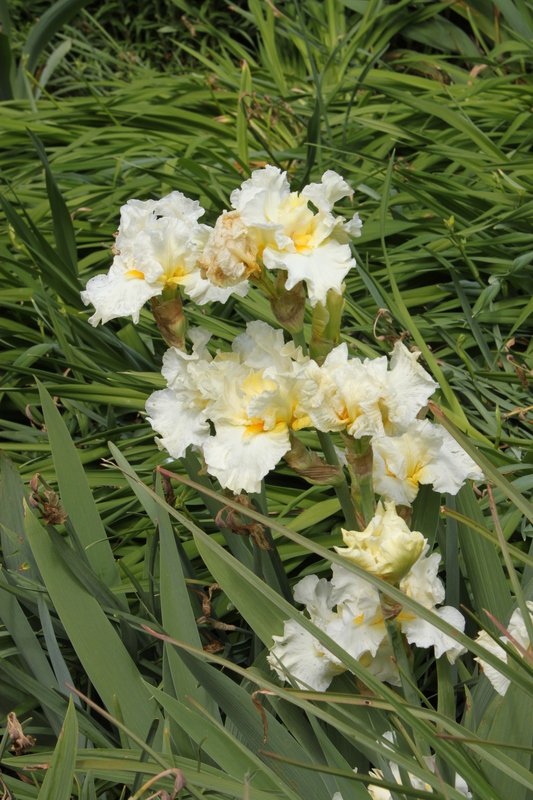 As at home in Japanese gardens as it is in an English Cottage Garden, the Iris is a most versatile and reliable plant. Its unique style and elegance provides a centre piece in any bed in the garden that provides the correct conditions. Iris’ have been favourites as far back as the Minoans over 4,000 years ago. 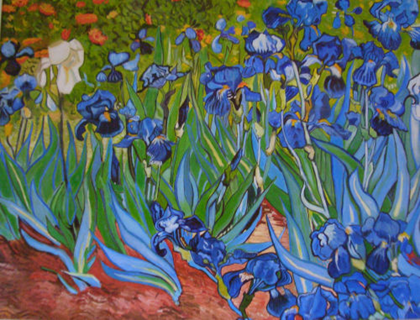 It is named after the Greek God of the rainbow and they inspired artists throughout the centuries including Van Gogh, with his paintings ‘Les Iris’ in 1889 and ‘Irises in a Vase’ and Paul Cezanne in his painting ‘La Vase Bleu’. 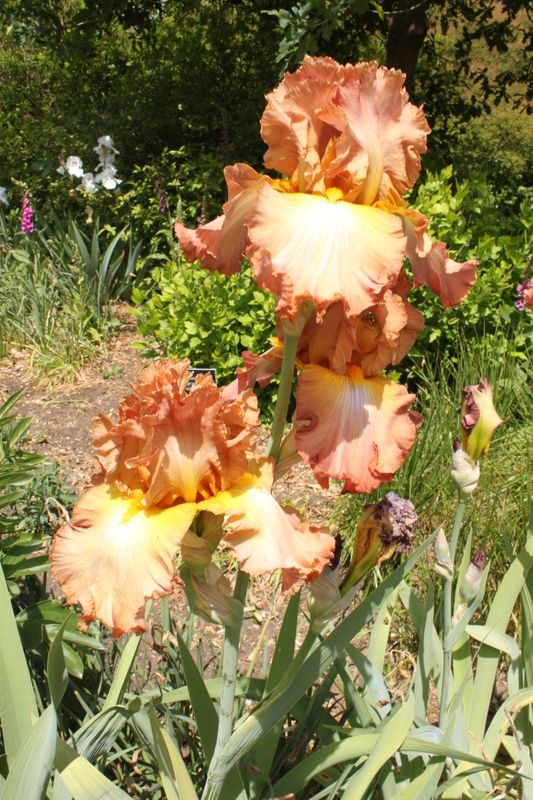 Irises are native in many parts of the world and provide an almost countless number of varieties too numerous to mention in a single article. So I have touched on a couple that I think are particularly striking. 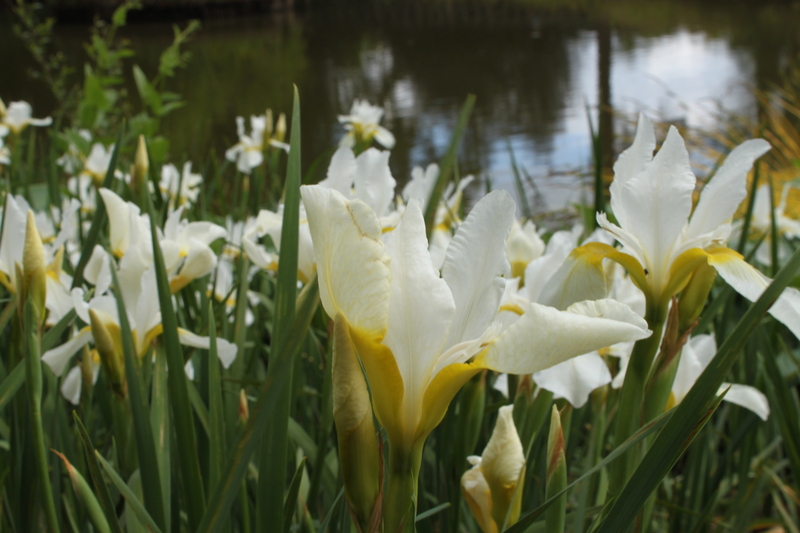 Siberian Iris are some of the most delicate and elegant of all irises. The delightfully named ‘Charm of Finches’ produces delicate white blooms with a tinge of lemon deep in the centre of the bloom. It is the shape of the blooms ‘floating’ above the leaves that makes these so enchanting. 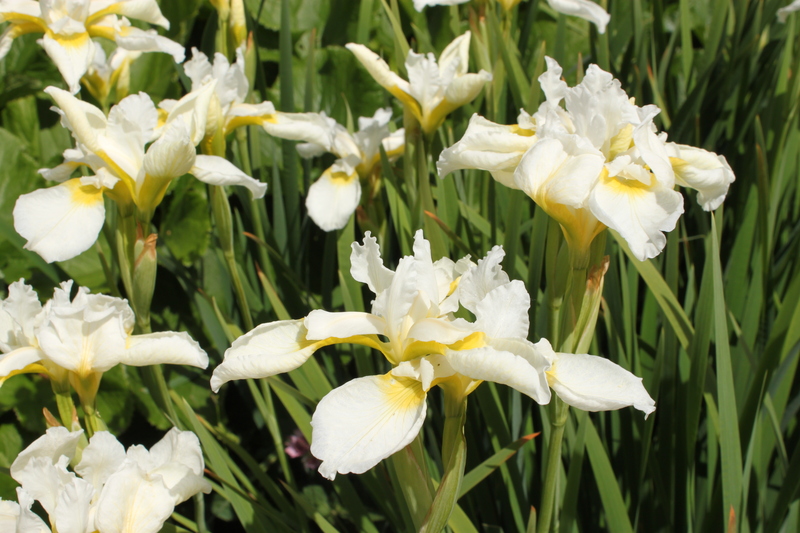 If this variety was inspired by a flock of finches then surely the similarly coloured but slightly more upright variety Iris sibirica ‘Fourfold White’ reflects the grace of swans. This variety catches the slightest breeze and thus adds a delightful movement to the garden. 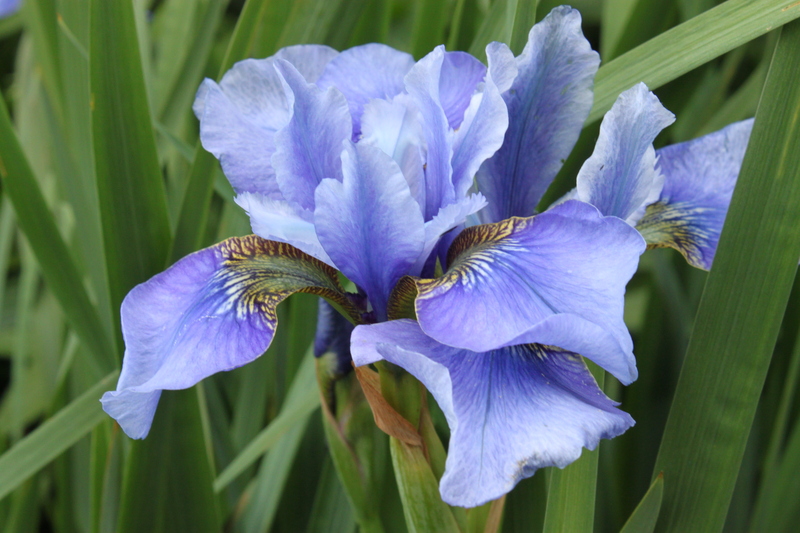 The Siberian Iris’ are more versatile than their more flamboyant cousins – the tall bearded varieties. 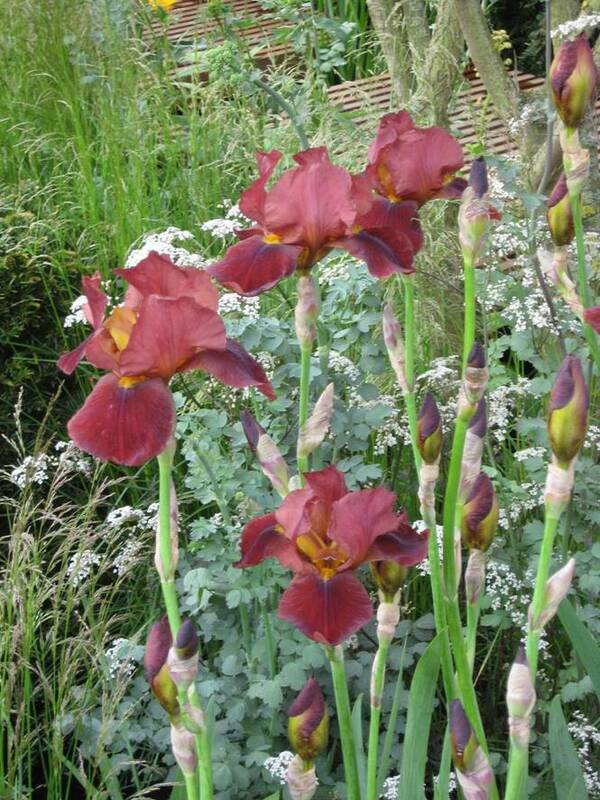 Compare the above with the bearded iris ‘Princes Sabra’. They are similar colours but perhaps not quite the elegance of the Siberian varieties. You could be comparing a ballerina with a can-can dancer! 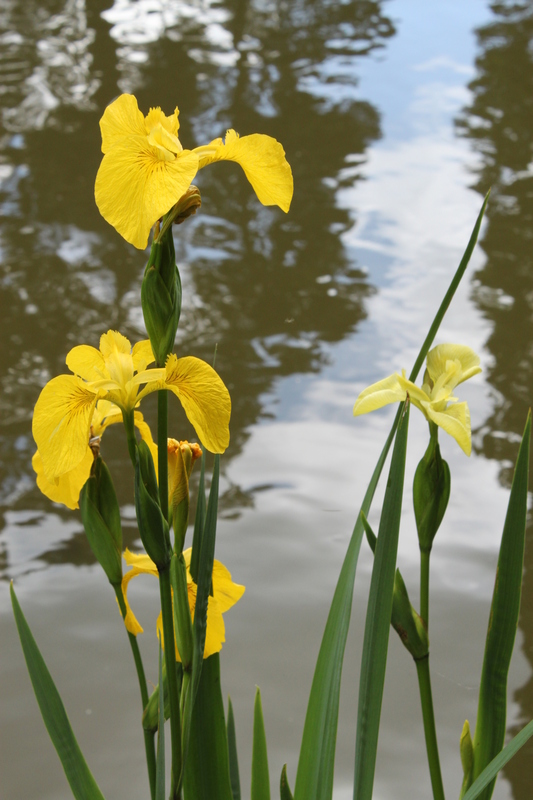 Commonly planted alongside water, the added element of the Iris’s reflection is great. In this example the impact of the combination of Iris sibirica ‘Ceasar’s Brother’ along side Cornus sericea ‘Sunshine’ and the water is simply stunning. Again the beauty of the understated simplicity of the Siberian Iris is so evident here especially when planted en mass with this classic deep purple colour. However, the lighter blues such as ‘Peg Edwards’ or even lighter ‘Mountain Lake’ are equally beautiful. There are many varieties of Iris native to the USA. The southern states in particular offer a good habitat for these to grow, especially around the damp marshlands and swamps. 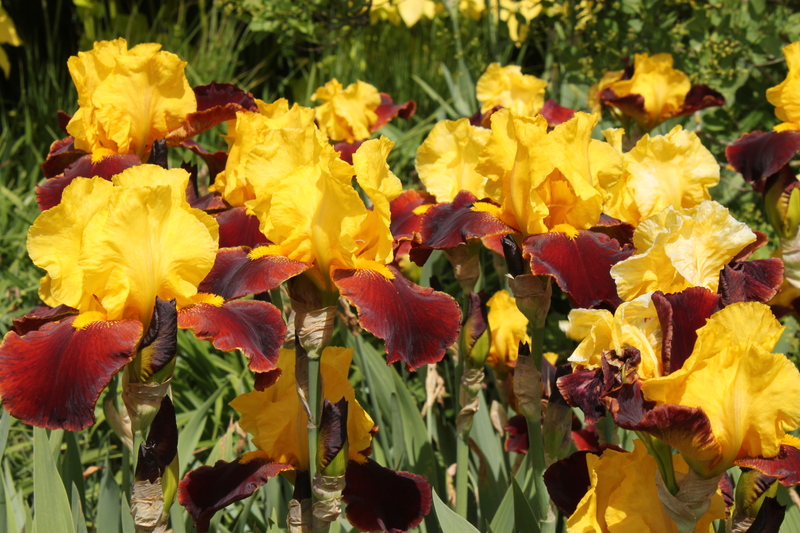 One variety of Louisiana Iris became popular a couple of years ago when it was used in several display garden and nursery stand at Chelsea. 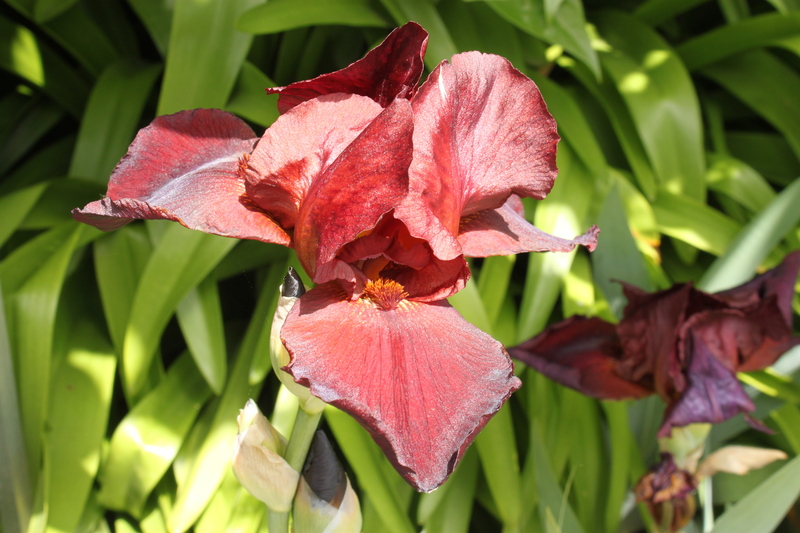 Iris ‘Red Dazzler’ with its dramatic colour looks particularly effective when planted alongside foliage of similar colour such as the Japanese blood grasses (Imperata cylindrica) and one of my favourite shrub/small trees Cercis canadensis ‘Forest Pansy’. It also looks good against the glaucous leaves of some Hebes or Hostas. What a colour! This provides great colour in a border in late spring and early summer – basically now. 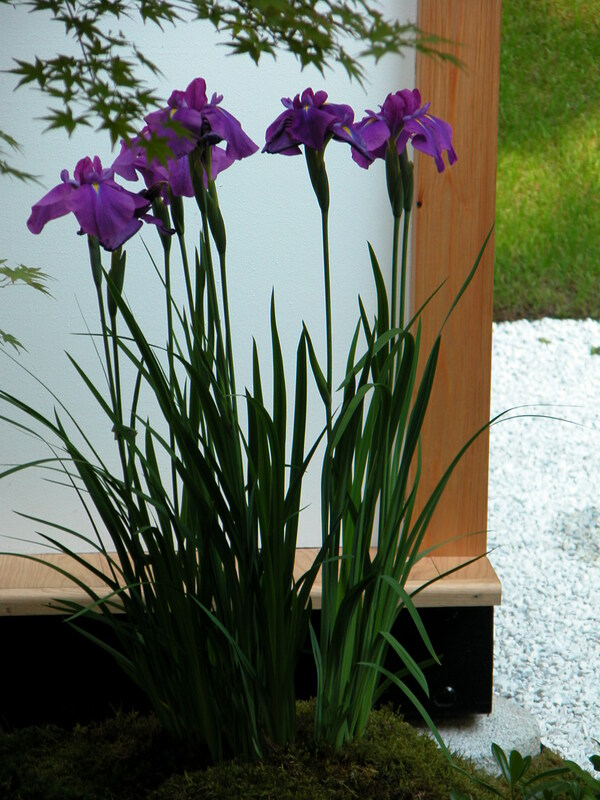 The Iris is held in great reverence in Japanese gardens, a symbol of good fortune. 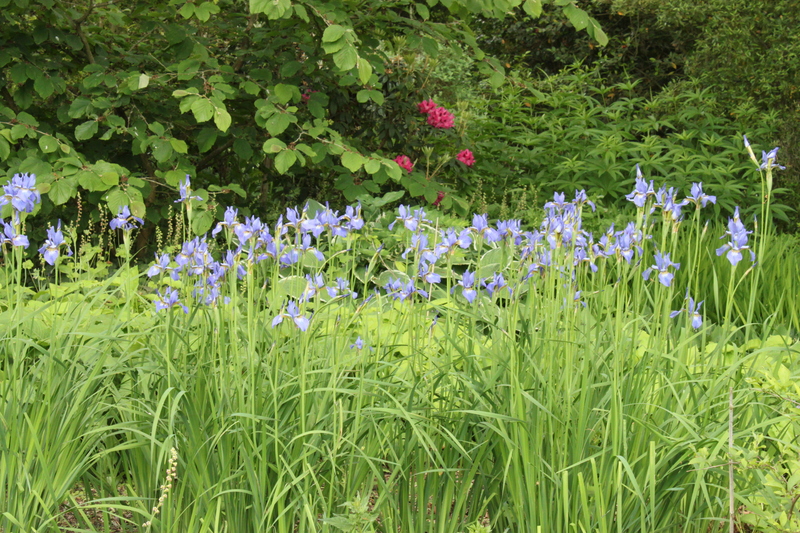 Although these irises are usually found naturally in damp conditions, can cope in dry sunny positions as well. 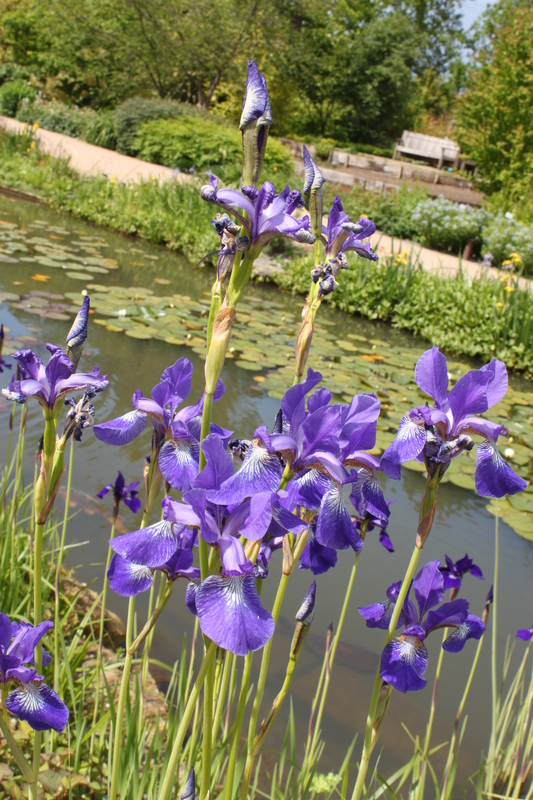 Unlike western drift planting, the Japanese garden tends to use a single iris as a focal point, perhaps seen from different aspects of the garden often reflected in still water, but always standing above the surrounding green foliage. 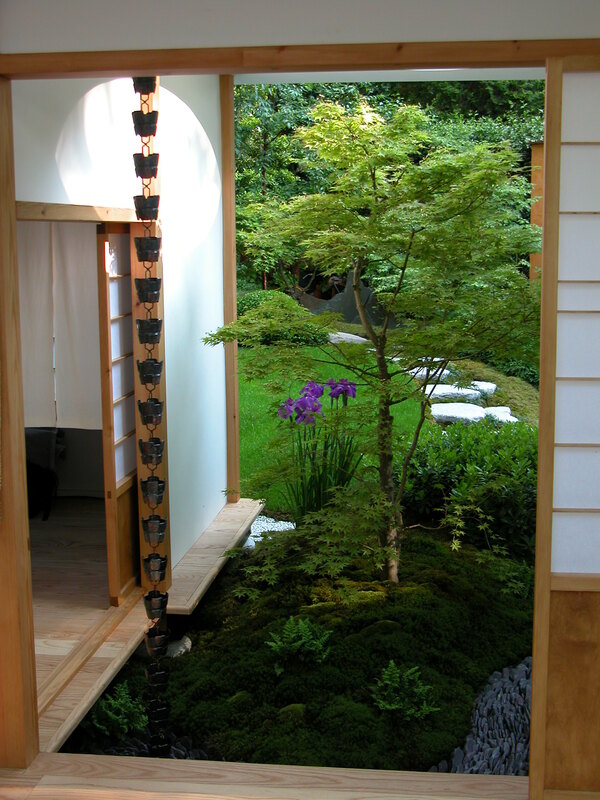 In this Japanese garden, the Iris is carefully positioned to be a visual feature on its own. The majestic purple framed beautifully against the rich emerald green of the mosses behind. The wonderful structure of the Japanese iris allows it to be a focal point itself, the single colour contrasting against the green drawing the eye to it. 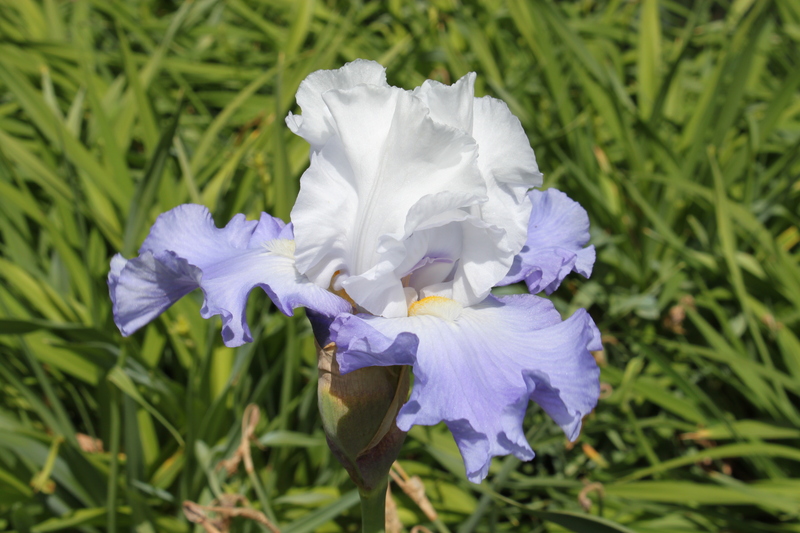 The Japanese purple Iris (Iris ensata – Haru-no-un) produces beautiful upright standards with a white splash on the drop petal. For the purists amongst you, I know I haven’t mention Pacific Coast Irises or the beautiful Spuria Irises or indeed the host on miniature Iris. Not even the delightful Stinking Iris! But with over 5,000 varieties available there has to be limits. 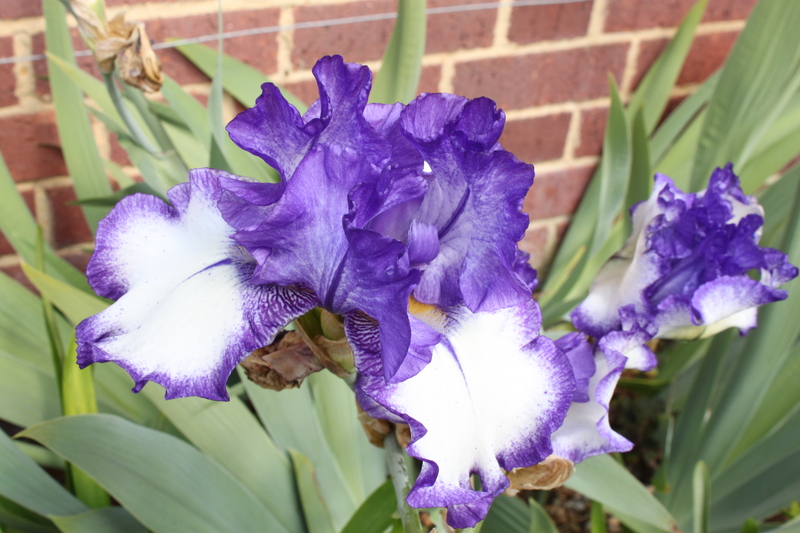 I can’t end though without giving recognition to one of our native varieties, the good old Flag Iris. 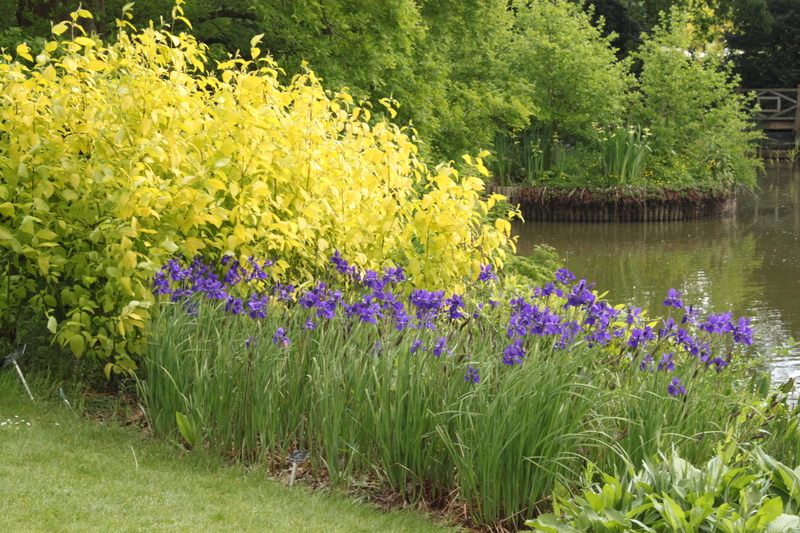 Resplendent with its dashing bright yellow blooms, it is always a site at the side of a river or a pond. 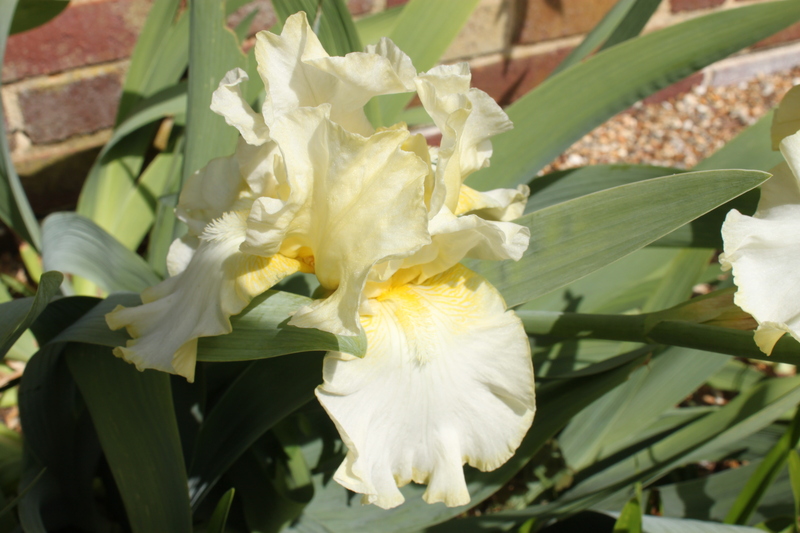 The Iris – A grand plant for any garden.